Millions of people across the world have heard of Jesus Christ, but how many are truly acquainted with the key locations he frequented? In the second edition of this established text, Peter Walker shares the fruits of his lifetime's research and expert knowledge to present a rich and engaging guide to the historical aspects of Jesus' world.Following the chronology of Jesus' life and ministry and drawing especially on the Gospel of Luke, we move from Bethlehem to Nazareth to the desert, and then follow him on his final journey from Galilee to Jerusalem. In each chapter particular attention is given to what Jesus did in that location, placing his ministry within its original historical and geographical context, and raising questions of archaeology, authenticity and the recorded evidence of later pilgrims and historians. This new edition takes into account the archaeological discoveries of the last 15 years to provide an up-to-date guide to the Holy Land of today. Using maps, timelines and boxed features that highlight and analyse key topics, In the Steps of Jesus is a rich and absorbing text that presents scholars at all levels of study with a unique insight into Jesus' world. 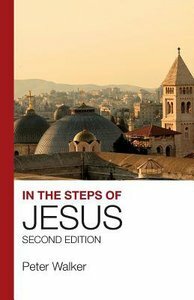 About "In the Steps of Jesus: An Illustrated Guide to the Places of the Holy Land"
The Revd. Peter Walker is a tutor in biblical studies at Wycliffe Hall within the University of Oxford. In addition to leading many tours to the Holy Land he has studied classics and early church history at Cambridge University and has done extensive research at the post-doctorate level on Christian attitudes toward Jerusalem.